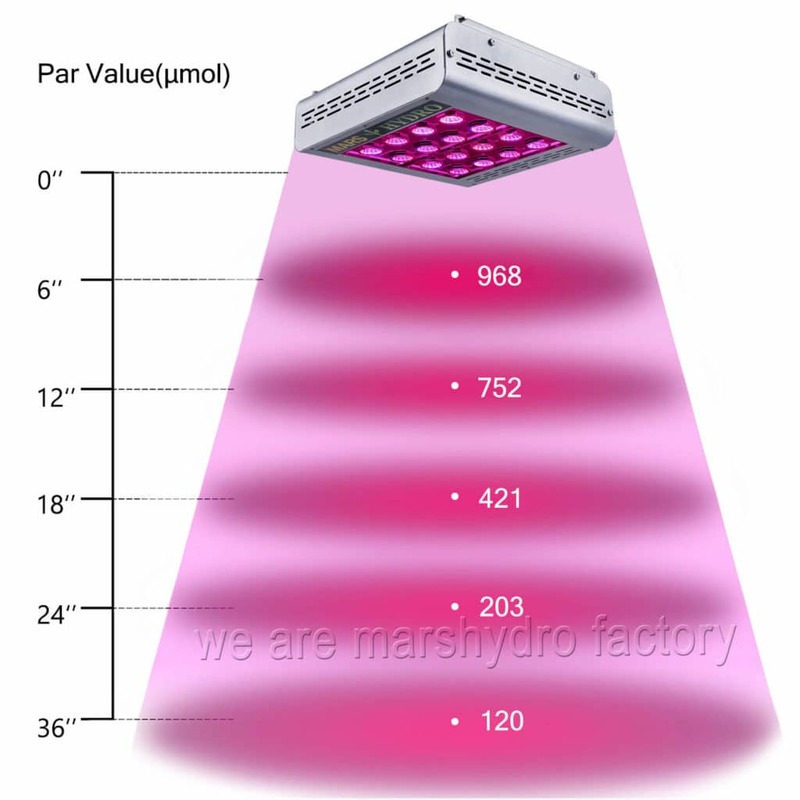 On growers’ forums, when people ask about reliable, affordable LED lights the name MarsHydro usually comes up sooner or later—and rightly so. The cheaper, entry level lights are perfect for getting started or kitting out a large grow space on a budget. But what about the top of Mars’s range? What do you get when you spring for one of Mars’s best lights, the Mars Pro II Series? In this review we’re going to take a look at the full spectrum MarsHydro Mars Pro II Series Epistar 400W LED grow light, with separate Bloom and Grow switches. If you want to replace a 250W HID light and cover a flowering area of 2’x2’, you’ll want to read on. And even if you want to cover a larger area… still keep reading. Because lights in the Pro II Series can be connected together. And, of course, larger models are available—five of them, including a couple with CREE LED chips for that extra bit of quality. 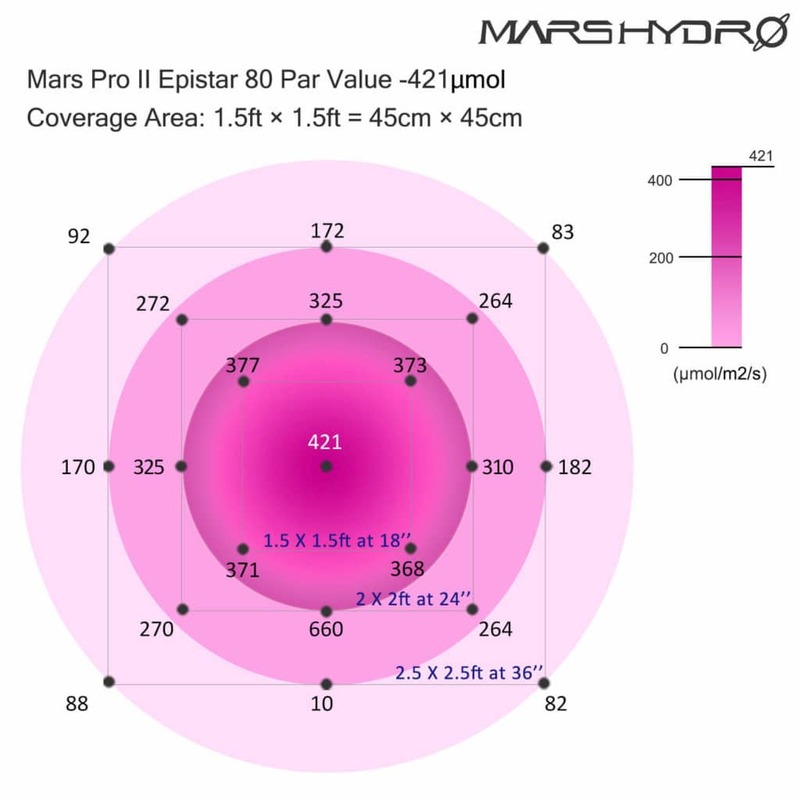 1 MarsHydro Mars Pro II Epistar 400W: What do you get for your money? 1.2 What else do we like? MarsHydro Mars Pro II Epistar 400W: What do you get for your money? In a nutshell: intensity, even coverage and value for money. Even Mars’s flagship models are accessibly priced. 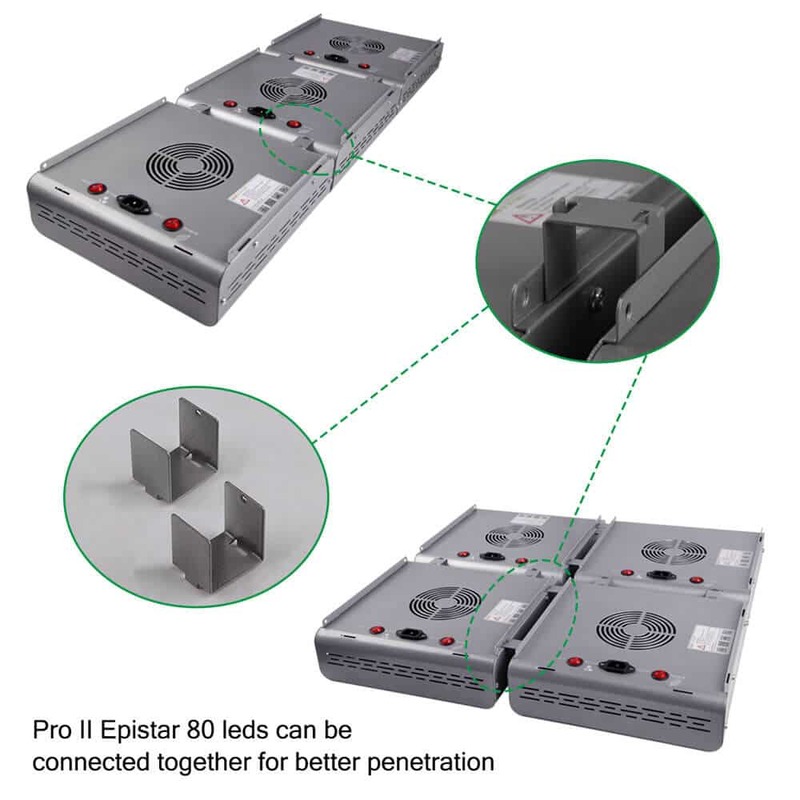 The Mars Pro II Epistar 400W (sometimes listed as the Mars Pro II 80), as its name suggests, packs 80 high intensity 5W Epistar LED chips. Having LED chips from a respectable brand like Epistar is always a good start, of course. And in addition to that, Mars sets the chips in reflector cups to ensure an even footprint and good spectrum mixing, with minimal light loss. With no secondary lenses, too, there’s also less chance of chips burning out. The chips are also zener-protected, so one chip failing won’t cause the whole light to fail. Pro II lights are full spectrum, so you can use this one for all grow stages. When you turn on the Bloom switch, it adds plenty of red light (including infrared (IR)) for a good flowering boost. And having separate Bloom and Grow switches allows you the possibility of saving some money on energy costs, as well as a little bit of flexibility in how you grow. Unlike its other lights, the Mars Pro II Series are designed to be connectible with a flexible U connector. While not quite as handy as being able to daisy-chain the lights, this feature still makes it easier to hang multiple units and get the best footprint out of them. As mentioned, the Mars Pro II Series 400W is capable of replacing a 250W HID grow light, while drawing only around 170W at the wall. But what about those all-important PAR figures? By way of comparison, those are better figures than similar sized lights in Mars’s cheaper ranges of grow lights. Or to put it another way, paying a few extra dollars for a Mars Pro II will get you that extra bit of intensity for bigger, tastier buds. Reflector cups around the chips help ensure an even footprint without hotspots too. Though much more directional than HID lights, LEDs do still need a little focusing to get the best out of them. So we think the slight efficiency loss from a well designed reflector is an acceptable trade-off. Especially as Mars use this method rather than lenses, which can sometimes lead to LEDs burning out. Another big advantage the Pro II Series has over some other MarsHydro lights is a longer warranty—the Mars Pro II Epistar 400W comes with a 3 year manufacturer warranty, serviced by local repair centers (for most of our readers). Well, this light is that little bit more expensive than some of Mars’s other lights. On the other hand, it is brighter than the equivalent cheaper models and the footprint is more even than the cheapest. So you do get value for money. Some growers would probably prefer dimmers for that extra bit of control over brightness and spectrum. And some will prefer a light with UV. UV light stimulates resin production, for more THC and terpenes. But UV chips are currently the least efficient and least long lasting LEDs and lights with UV tend to be a little more expensive. 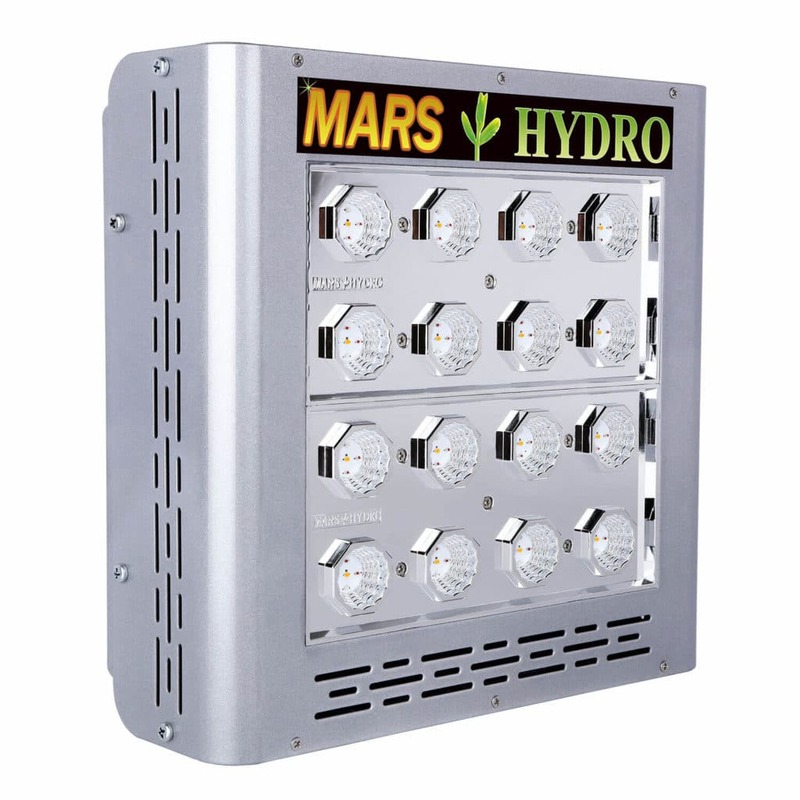 The Mars Pro II Series is MarsHydro’s most expensive range of lights… but it’s still MarsHydro, so they’re still well within the price range of most growers. And we think that extra expense is worth it, because it’s backed up by more intensity and a more even footprint. Not to mention a longer warranty, should you need it. And the option of a couple of models with CREE LEDs. Like the rest of the Series, great value for money—and even better value if you buy it from the DazzleKat store. I’m thinking about getting a new light. A big factor for me is that it’s cost effective and I get the most grams of high quality bud per watt. I’m not growing for commercial use but I still want the best bang per buck (or £0. I’ll grow only one or two plants at a time. Electric is a big part of the cost in the UK so I was looking for LED lights with two switches for grow and bloom as well as dimmable lights using pulse width modulation. Unfortunately I can’t find a cheap light with all these features. Do you have any recommendations? Then I came across a page comparing Mars lights and grams per watt. What you need to look at is PAR values. PAR, as you might know, is photosynthetically active radiation, referring to the spectrum of light a plant can actually use for photosynthesis. “PAR values” generally actually refers to PPF or PPFD which is a measure of how many photons of light (µmols, or micromoles) in that spectrum are falling on your plants per square metre per second. By the way, ultraviolet LEDs are the least efficient, so don’t worry too much about getting a light with UV in the spectrum. By all accounts, just adding in a cheap UV aquarium light during flowering will get you better results for less money then UV LEDS. Also, bear in mind that there’s a lot of debate about whether you get better results from using a fixed spectrum for the whole grow (maybe adding in supplemental red and UV lighting during flowering) or using a light with bloom/grow or veg/flower switches. So maybe consider whether you definitely want dimmers. As far as I can see, which is the better method depends somewhat on what you want from your end product. For instance, if time is of the essence, not making a major change to the spectrum arguably gives you slightly quicker grow times, as the plants don’t need to adapt themselves to a new spectrum. Keeping a fixed spectrum and dialling up the red and UV arguably better mimics the sun when cannabis would naturally start flowering. Lumens are a measure of how bright a light is to human eyes. However, plants use and react to slightly more wavelengths of light than we’re able to see — what they use is called the PAR spectrum. PAR stands for Photosynthetically Active Radiation, which broadly speaking is the spectrum of wavelengths a plant can convert into fuel for itself through photosynthesis. Beyond each end of that spectrum there’s also ultraviolet light and infrared light, which plants don’t use for photosynthesis but which they do respond to in other ways. For instance, UV causes cannabis plants to produce more resin (and therefore more THC and terpenes) to protect from the UV rays, much like we’d apply sunscreen. Some lights include UV and/or IR, some don’t. Anyway, you’ll still find a lot of advice out there about lumens, because the spectrum of light that’s visible to us isn’t too much smaller than the PAR spectrum. So advice regarding lumens per square-foot isn’t totally without merit as a rule of thumb. However, although lumens and PAR are both measures of brightness, or a light’s intensity, PAR is just that bit more accurate. One final thing worth noting, usually when growers or manufacturers talk about a light’s “PAR values”, what we’re really referring to is a measure called PPF (or PPFD), which is how many photons of energy the light is emitting within the PAR spectrum per square meter per second. 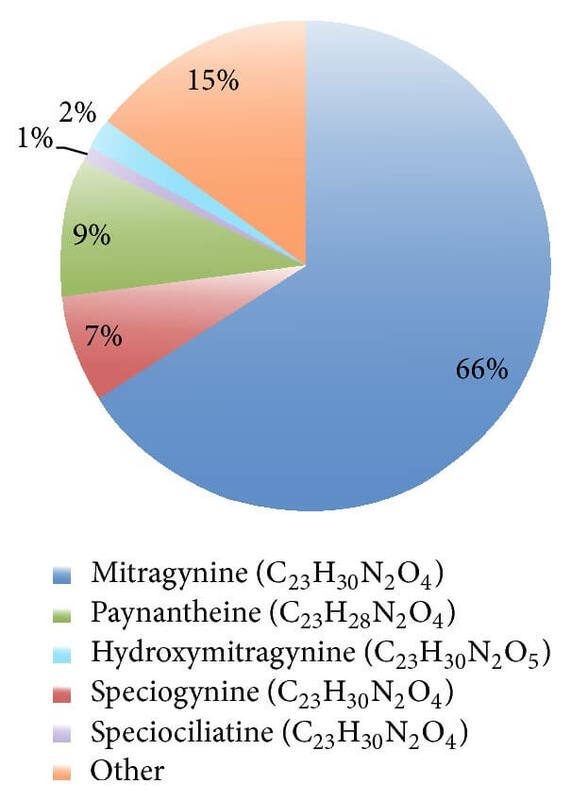 In other words, how many photons that it’s emitting that your plants can convert into sugars to store and use as fuel. This is measured in micro moles (µmols), one-millionth of a mole. Getting around 25-30 moles per day is good for cannabis; some commercial growers aim for 30-40 as the absolute optimum. But anything above 40 is generally agreed to be wasted light. Light requirement also varies a bit from strain to strain — your seeds may even come with advice about Daily Light Integral (DLI), which is roughly speaking how much light you need to give that plant per day. During flowering (i.e. a 12 hour day), it should give you 32.49 moles per day (752µmols * 60 * 60 * 12 / 1,000,000). Finally, the crucial thing to pay attention to is whether a light can give your plants enough moles over a 12 hour period when hung at the recommended height. Because, during flowering, you won’t be able to compensate for a less powerful light by simply leaving it on a bit longer.